The big question circling my brain for the last few days has been what should I add to my housetop blocks. A quick gallop through my thought process would go: pinwheel, hourglass, pinwheel, a different version of log cabin, hourglass...What this amounts to is that I was having a hard time letting go of what had been in my head way back when, even though I had abandoned the initial plans. I'm sure that you could shut your eyes, pick one of the options and, with a bit of application, come up with something that worked. But I didn't do that. Instead I engaged my brain and tried to understand why I couldn't settle. The answer I came up with was that in all cases what I pictured in my head was too static - just a collection of big, square blocks with different things in them. Again, that's I'm pretty sure tha's not how it would be if I sewed them, but it's definitely what happened when I just conjured up a mental image. So I moved away from square-based options and made this long, thin, pointy thing instead. This, in fact, is not unlike the long, thin, pointy things I was in love with before I even started, so it pleases me inordinately that I have ended up here. Of course nothing is simple: my housetops are nice and big, but when I made a big pointy triangle strip I didn't like it, so this one is teeny. It seems like my mind just likes lots of little pieces; wherever I start from, they sneak in somewhere along the way. Ho hum. I added the strip down the left hand side first, but now I've added one at the top on the right too. I have a cunning plan. I also have socks that match my sewing. I'm linking this post up with Linda and Julie for Sew, Stitch, Snap, SHARE. Oh yes, this is looking promising! Love this teeny addition! I like little pieces too and your matching socks. YES!!! I knew you would find the missing answer! Love watching how this is going! This is a fun project, matching socks and 'liberated' saw teeth, adding great contrast by the way! Shades of Baldrick in your remark at the end of the post! Loved him. I love the pointy strips they fit beautifully with the house tops - and I like your matching socks!! You mention that you abandoned initial plans - isn't it frustrating when we have an idea but when we put it into practice it's just not what we thought. I cut into quite a bit of fabric today - I too had a cunning plan - didn't work for me so another start tomorrow. 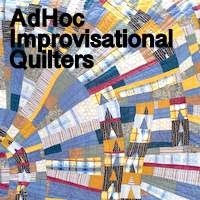 I'm looking forward to watching the happenings with this new quilt. Really does draw your eye to the little pieces. Great socks! Love the tiny pointy things! I like the contrast in size from the bigger half log cabin blocks and it's a great way to use up those small scraps! I like the sparseness of your long triangles; the space between them opens the block. And I'm so glad your sartorially elegant while sewing. I'm sure your hair is coiffed and lipstick on, too. A magazine article from the 50s made the rounds again last year recommending these details along with a clean house before sitting down to sew. Those pointy things make a nice addition. I'm jealous that I don't have socks to color coordinate with all of my quilts or to inspire me when I'm stuck on what color combinations to use. So do you have matching socks for each of your quilts then? Looking forward to seeing where this project goes, sometimes you have to go with your initial idea, if it's speaking to you the loudest. Thanks for linking to Sew, Stitch, snap, Share.